Another lovely blog design, Edria Lovely Design. 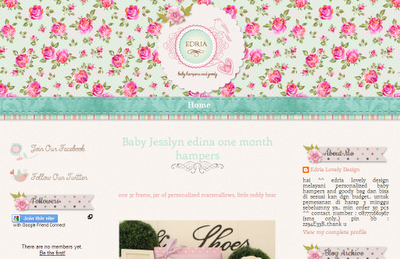 Edria Lovely Design is a online store sell baby hampers and goody. She asking for a shabby chic vintage flower and I combine it with scrapbook style. Of course a pastel color of pink and blue. The cute design match with the product sold. I really like her product too. Cute baby hampers and goody for special baby gift idea. And this is one of Edria Lovely Design baby hampers product. So cute, isn't it? oh really warm color and soft.. like me, like a baby.. haha..
kalau mw pesan template gmn crny? bisa kah pembayaran mengunakan pulsa? mba..tempat buat download template tpi yang cute ky gni :3 dimana y mba?? Kak ini download templates nya dimana yah? download template yang cute-cute kayak gini dimana kak?? Gimana cara order templatenya Mba? Gimana cara order templatenyaa Mba? Kok gak bisa di download ya? Atau ini buat sendiri?